Smoked meats are a huge time-saver and hit my weekday lineup at least once a week. Most are already cooked so they take no time to get on the table which works wonders with our crazy, hectic, homework, practice, lions and tigers and bears, oh my! weeknight routine. I bought a pack of smoked pork chops and was just planning to heat them up and call it a day when I got to thinking how much I like a little sweet and a little heat with most smoked meats. So I threw all this together and hoped for the best! Don’t let the chili powder scare you off. It’s not as spicy as you think. My onions ate it up without batting an eye. Line a baking pan with aluminum foil (for easy clean-up) and spray foil with cooking spray. Arrange pork chops in a single layer in pan. If using a ham steak, blot off any excess liquid with paper towels before applying glaze. Combine orange juice, brown sugar, chili powder, garlic and mustard powder in a small bowl and mix well to make a glaze. 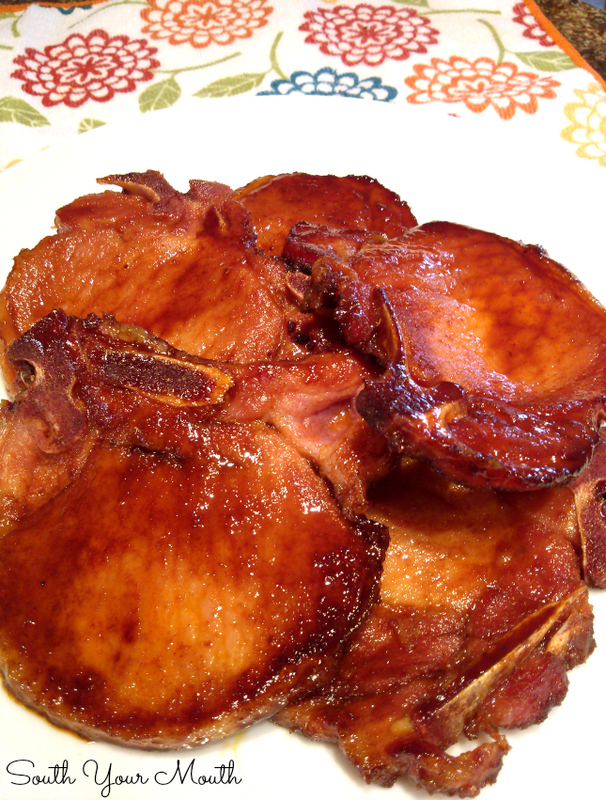 Using a basting brush or small spoon, coat top side of pork chops with glaze; discard any excess. Bake pork chops at 400 degrees for 20-25 minutes or until chops are heated through and glaze is caramelized. Baste again with any residual glaze from the pan if desired. Smoked and cured pork chops and ham steaks are already fully cooked – we’re just bringing these to temperature. *Use whichever citrus you have (lemon, grapefruit, orange, etc.) or even use prepared fruit juice. I didn't actually measure this so I’m guessing on the amount. You’ll need enough liquid to make the brown sugar mixture the consistency of ketchup. Those look fantastic! I am so going to make them! Wondering if I could use (unsmoked) pork chops as that's what I have on hand. I'm not sure. You'd have to cook the chops longer since they're raw and the sugar might burn. Maybe cook halfway through, then glaze. Made this recipe with a Smoked Ham Slice yesterday and was not impressed. It seemed that the Chili Powder overpowered the taste of the ham and it was kind of weird using Chili Powder on ham. Just kind of strange tasting. I agree with F Croom. I made this for dinner and neither my husband or I was impressed. Probably will not make again. Made them about a month ago and loved them,in fact, having them again tonight. Just enough heat to sweet ratio. I made these recently and my husband and I loved them!